In less than 1 month, a top fashion ecommerce site increased its revenues by 86% and their average revenue per visit by 117%. Conversioner teamed up with one of the top fashion e-commerce sites to increase their online sales and help with landing page optimization services. Launched in 2008, the online shop provides high fashion and designer brands to worldwide women and teenagers. 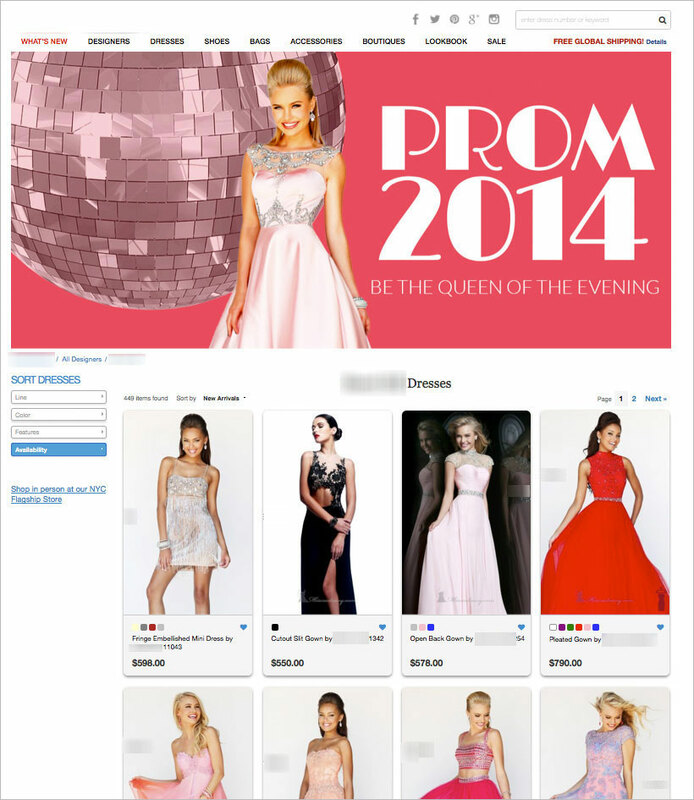 During the first part of tests, we focused on one of the prom designers and are now widening our tests to the rest of the site. Starting out we begun with our emotional research, studying and running an in-depth analysis of the psycho-emotional triggers of the audience. Narrowing it down to two emotional triggers, we defined the audience, located the leaks in the original funnel, analyzed the current traffic results and start creating the funnel. Messaging: The design and entire messaging was focused on being a queen for one night. The importance of selling the dream that comes with the dress and the social acceptance and prestige only these dresses could achieve. Happiness is not determined by where we are but to which reality we’re comparing it to. By using specific messaging for these young and adult shoppers we were able to create a better and most promising reality for them and take a step further towards their dream. Design: A new conversion focused designers page was designed and built starting with concept, copy and wireframe. The final deliverable was conversion-focused designer pages to increase sales and brand affinity. Different products, colors and images were placed in specific areas to get eye attention and increase CTR. Every pixel on the page was designed to fit with the strategy and the emotional triggers. User interface: Small technical changes were made to allow easy navigation. For example, the segmentation box was now located on the left hand-side allowing it to scroll with the shopper as they go. In addition links leading out of the shopping area were reduced in size and moved to a more strategic location, allowing for easier browsing. One of the most interesting things about this test is that for the first 3-4 days our pages were under-preforming revenue wise. From day 5, the pages started outperforming the original page with double the transactions and kept this way for 2 weeks. Patience: One of the biggest challenges we have with our partners is getting them to wait, sit back and let things settle. When uploading a test it is extremely important to give the test time, not to rush into things and not to make any hasty moves. Quality: Presenting a better UI and messaging ensured the users who didn’t convert in the first 3-4 days returned to our site. This is the same pattern we see in all of our tests; a conversion optimization strategy that includes emotional targeting delivers much higher quality clients and results. What was your latest test you did and what did you learn from it?